BOCA RATON, Fla. — Six weeks ago, a group of coaches, managers and referees informally met with NHL hockey operations executives at All-Star weekend to provide a “reset” for video review. The NHL’s 31 general managers will attempt to repair the coach’s challenge system starting Monday when they convene for their annual three-day meeting. The coach’s challenge has been victimized by unintended consequences, exactly what commissioner Gary Bettman warned against before GMs voted in video review in 2015. A system designed to catch the egregious missed call is fixated on minutiae. Now the goal is to find a reasonable fix to inspire confidence via better consistency ahead of the Stanley Cup playoffs. “No one knows what’s going on,” Maple Leafs head coach Mike Babcock said last week. “We better get it solved. Just saying ‘Okay, we’re going to leave it the way it is …’ No chance. Get it fixed. Both goaltender interference and offside challenges are expected to be tackled. The more difficult fix is in goaltender interference, which has been the more vexing review because of both the purposely vague wording in the rulebook and the subjective human nature of referees, with each one viewing each play through a slightly different prism. This season, one could almost flip a coin to try and figure out which way a review will go. Through Saturday night’s action, 145 scoring plays were challenged for goaltender inference: 98 calls were upheld (68 per cent), 47 on-ice rulings were overturned (32 per cent), wiping out 41 goals while turning six non-goal rulings into goals. The first step will be to quiet the criticism. Comments like the one from Babcock will be discouraged. The GMs do not have a long list of options at their disposal. A full-scale rule change ­– such as adopting the strict international skate-in-the-crease style – will not happen midseason. Plus, there does not seem to be much of a demand for that. A procedural change is more likely. The belief is GMs have an appetite to centralize the decision-making pool to the NHL’s Situation Room in Toronto for consistency’s sake: if a smaller pool of people has the final say with regularity, coaches and managers could have a better idea of what to expect. One problem is NHL referees have fought to keep the final call in their hands. The solution to that would be for referees to have a nightly presence in the Situation Room. Referees speak the same language, they can relate to the situation on the ice and provide guidance. The question then would be how to staff it. Would a group of recently retired officials be interested? Well-respected referees Mike Leggo and Greg Kimmerly are among the recent retirees, plus veteran Dave Jackson is hanging up his skates after this season. Making nights in the Situation Room a rotating regular assignment for current officials, like the NBA and MLB do, would defeat the purpose, since their opinions would all vary in the same way we currently see on-ice. A dedicated team of three or four referees would be necessary to have a presence in Toronto. It is unclear whether the NHLPA would need to approve, or simply be apprised, of a procedural change like that to the application of the rule. The offside challenge is easier to solve by tweaking the wording of the rule – not the spirit of it. GMs had no appetite to do so last year, despite the urging from Hockey Operations, but frustration has bubbled over because of nuances like a skate being inches off the ice. Through Saturday’s slate, there have been 53 coach’s challenges for offside. 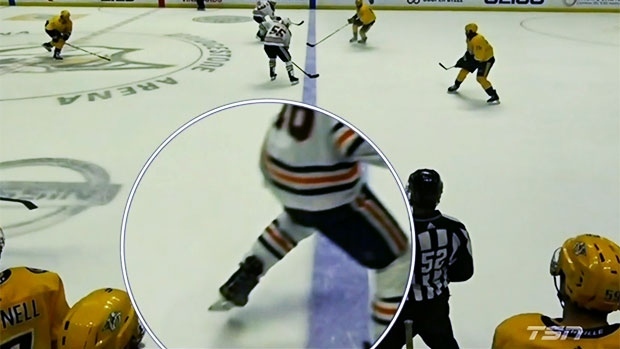 Exactly 36 of those calls were overturned (68 per cent), a large majority of them because a coach or video assistant noticed a skate hanging in the air that might change the call. Only 17 calls have been upheld (32 per cent). 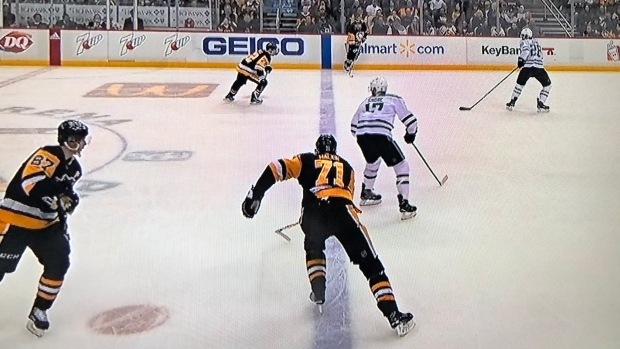 Tweaking the wording of the rule, which has been in place since 1929-30, would make this straddle by Pittsburgh’s Evgeni Malkin (below) “legal” even though it always would have been called that way in real time if not for high-definition cameras posted at the blue lines. Playoff format: Managers have expressed concern over the current playoff format, with top teams guaranteed an early exit based on the divisional format. Whether they have an appetite to vote for change remains to be seen. One alternative seen as a popular compromise would be the return of 1 vs. 8 conference-based tournament without wild-card teams. Power plays: Managers have discussed the idea of changing minor penalties to one minute during overtime, as well as for compulsory infractions like puck-over-glass. There is also a proposal tabled to make every faceoff on a power play in the shorthanded team’s end. Long-term injury relief: This item was on the agenda for the December meeting in Montreal, but GMs ran out of time during that two-hour meeting to discuss salary cap flexibility granted to teams for injuries/illness to Marian Hossa, Joffrey Lupul and Nikita Soshnikov. The NHL previously ruled those transactions were rules compliant.